My Virtual Tutor has a series of educational tools that will engage children and help them maintain their attention. While the child holds their DS vertically like a book, the the virtual tutor will guide children through 8 interactive books and encourage the child to complete fun exercises and quizzes to improve reading skills. Through self-correcting practice, the different modes of interacting with the exercises and stories advance along with the player. My Virtual Tutor: Reading was developed by 1st Playable Productions, LLC. 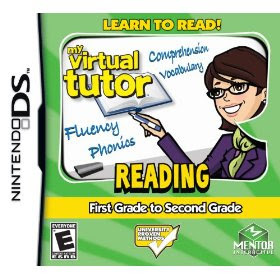 My Virtual Tutor: Reading for the Nintendo DS is available at mass and specialty retailers throughout North America such as Toy R’ Us, GameStop, Best Buy, and Amazon.com for a suggested retail price of $29.99. The Pre-K- K SKUs is rated EC (Early Childhood) and the K-1st Grade and 1st-2nd Grade SKUs are rated E (Everyone) by the ESRB. For More Information on My Virtual Tutor: Reading and to become a fan of My Virtual Tutor: Reading on Facebook or follow updates Twitter, please log onto http://www.myvirtualtutorgame.com.